Thomas G. Vossler Financial Advisor Buffalo, NY Thomas G. Vossler – Trubee, Collins & Co., Inc.
Tom Vossler joined Trubee, Collins & Co., Inc. in 1983, attaining Partner status in 1997. 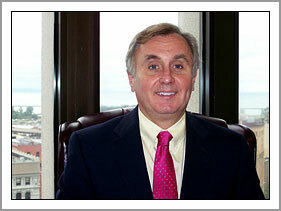 Tom’s clientele is primarily comprised of retail business with investments in both the equity and bond markets. A significant portion of his business is devoted to retirement plan asset management including Profit Sharing and 401(k) Plans. Tom’s investment style can only be characterized as a “Graham & Dodd” style, emphasizing “value” with a dividend! As a long-time City of Buffalo resident, Tom is active in the community and currently resides in the Central Park area of the city. Tom and his wife, Lori, share their home with their three daughters and a Great Pyrenees dog, Kirby. When Tom is not busy being involved with Buffalo Politics you can find him either running local marathons or skiing the slopes in Ellicottville.